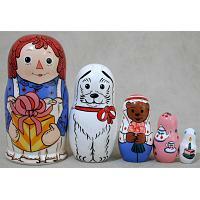 First ever officially licensed 7-piece Raggedy Ann & Andy Russian nesting doll! 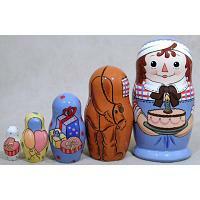 Tallest doll: 6 inches tall. 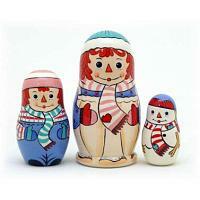 Hand painted in St. Petersburg, Russia, this matryoshka captures the heart-warming spirit of two American heroes at play on a frosty winter's day. 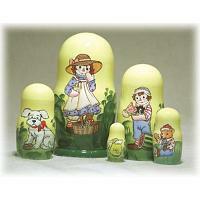 Their faithful friend Fido is there, too, not to mention this is the only officially licensed nesting doll depicting the famous Camel with the Wrinkled Knees! Raggedy Ann & Andy never have a dull moment, nor ever leave their virtues of love and kindness at home. 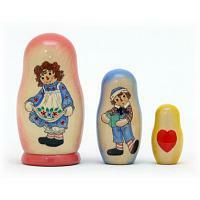 This collectible nestable makes a great companion piece to Johnny Gruelle's books, giving your children one more way to explore and experience the true hearts of the famous Raggedy siblings. Copyright Simon & Schuster, Inc. Licensed by United Media. 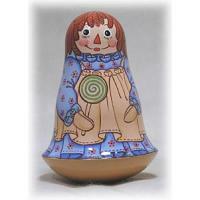 Raggedy Ann and Andy and associated characters are trademarks of Simon & Schuster, Inc. Stocked in the U.S.